I was sent a link to the following map by Rob Story. I can't bring myself to thank him...it made my eyes bleed and I genuinely do not know where to begin in dissecting it. It goes straight to the top of 2014's worst map so far list...and that's something given we only recently saw the NBC Nightly News abomination. It's from Newsweek's Tumblr though tracing the true origin and figuring out who made it is probably a good thing. What does it show? Who knows. What do the colours mean? Impossible to tell, even on a well calibrated screen. What data is being used? Nope...dunno. 61% of what? What 'fan votes'? Why map two variables with virtually the same colour? Why? WHY? Why use an unclassed choropleth? Sorry, I give in. Why does 'more' seem to be shown in lighter colours in the two things but the inverse is true? Bad. What is the actual point? Possibly to show how bad a bad map can be? Is it a joke? I sincerely hope so. It is that far from the normal cartofail scale it defines its own scale! Congratulations whoever you are...my opthamologist will be in touch. Update: Thanks to Martin Elmer for pointing out an inaccuracy in the original post. He also points out it could well be a screen grab of an interactive map. Possibly yes...though most of the problems still apply. I'm a Brit. I don't get baseball as a sport. I've been to two games but it's just not cricket. 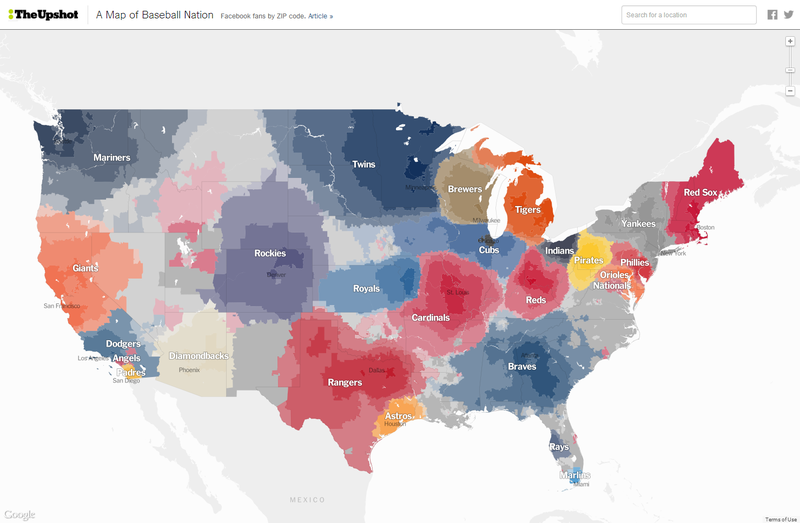 So I hope that makes me an impartial viewer of the New York Times map of Baseball Nation recently published. Unfortunately I know a thing or two about maps so although I inevitably bring some subjectivity to any assessment of a map I try and look at them objectively. So to the map. I'm a huge fan of The New York Times graphics work. They sit at the pinnacle of quality journalistic map-making and information graphics. 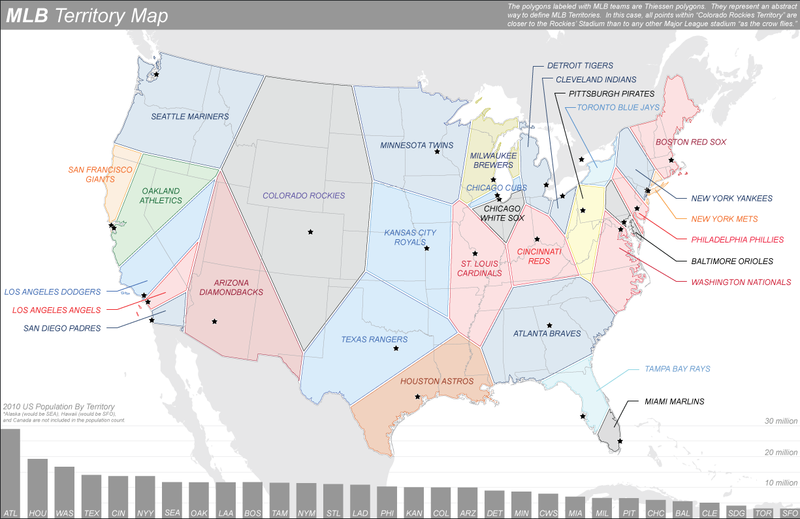 Their Baseball Nation map has at least gone one better than the somewhat tedious current trend of creating voronoi maps of various themes - including one of baseball territories recently produced by the Washington Post (below). It's like all of a sudden people have found out about Delaunay triangulation and Thiessen polygons. Whatever next? Hexagons again? Ignoring the clumsy use of Web Mercator, the obvious problems of Alaska being so remote and enlarged (as are the territories of the teams in the northern states), and the difficulty in seeing some of the overprinted text then let's look at the map which is a weird patchwork of 'territories' of support. Data. It's made with data from Facebook, specifically Facebook fans by zipcode. The State with the highest penetration of Facebook use is Kansas at 61%. the lowest is new Mexico with 35%. 71% of online adults, more women than men and those younger rather than older use Facebook (Pew Factsheets). So as a data source it's perhaps more representative than Twitter but it's still seriously flawed. At best it reveals some interesting aspects of Facebook use but cannot be necessarily extrapolated to represent all baseball fans. Sure, there is perhaps no other way of getting data that can give us a sense of territories and this at least gives us a picture...but as with so many of these sorts of social media related maps I'd like a little less of the map being promoted as definitive. Any map is only as good as the data. Most social media based maps should come with an extremely prominent health warning about the potential flaws before people go off interpreting the map as irrefutable fact. Colours. The map shows the predominant support using colours broadly associated with the teams. There's an attempt to show the edge effects of dwindling/overlapped and mixed support the farther away from a team by using lighter values of colour. This works quite well but can be confusing. Reds bordering reds? Greys across the map where bordering teams are different colours? Closer inspection reveals that this represents national patterns of support for teams that are quite remote (for Yankees, read Manchester United). Some of the colours create extremely hard boundaries that perhaps are more mixed than they at first appear. When you look at the data there is often more of an even mix than any use of a single hue can represent. Interaction. The map is simple to navigate. What works well is the hover-over tooltip that gives us some percentages of support. At least that clarifies the mix of support but the county level summary often doesn't seem to reflect the zipcode level patterns the map shows - particularly when the pattern shows a range of colours/shades. I was sometimes left scratching my head trying to figure out the relationship between percentages of support and colours on the map as they don't always seem to correspond. I like the boundaries being named in honour of players and historic rivalries and grudges....that gives us a sense of meaning and why there are boundaries at all. A nice discussion of these is in the accompanying report. However, there are areas where current likes seem to overcome historical patterns of support. I picked up a discussion between Craig Williams and Brian Timoney on the apparent cleansing of Mets support from New Jersey. Of course, Craig pointed out that they may, of course, use MySpace and hence the data problem, though this example is tongue-in-cheek, is perfectly illustrated. Finally...like I said, I'm no baseball fan and I don't really follow it but I was under the impression that the Toronto Blue Jays played in the league. Toronto are a Canadian team and while I wouldn't expect to see much (if any) support on the US side of the north eastern border...why is the team and Canadian data excluded altogether? Maybe on Web Mercator that would have just looked too much? Changing Face of America. Bravo! No one wants to see bad maps...or maybe they do, because they keep those that can make good maps in business and they give educators some great material. Without cartocrap, what would we have to keep us entertained? How would we be able to discern good from bad? What would I have to write about? OK - that's maybe a question too far. So today social media was lit up like almost never before at the sheer horror of the following effort from NBC Nightly News. Go on, drink it up, then rub your eyes and take another look. What were they thinking? It's an area graph...showing three different time periods but they've gone and clipped the rectangular graph using the shape of the US to create what I am sure they thought of as an uber-information graphic. Clipping to a shape destroys the visual impression of relative areas across the chart since we have no baseline or simple geometry to anchor our understanding of the pattern. Without reapportioning the areas of the graph to the new shape it leaves some of the categories completely dissected and reduced in area relative to the rest. That's those at the top if you were wondering. We can't even make any sensible vertical interpretations because that wretched coastline gets in the way. But worse...has the space-time continuum gone awry? Do we progressively travel back in time if we go east to west? Argh...but the east coast is in the future and the present is roughly down the Mississippi. Great Scott!!!! Perhaps Emmet Brown threw the original graph in a flux capacitor and this is what was churned out the other end. Or given the rainbow colours, maybe Marty McFly threw in some ideas? Back to what the graph shows...OK, it's on a map, so it's a fair assumption that we're seeing a spatial relationship because it's on a map...so all the white population live below a very specific curvy line - they get a lot of the west coast and southern states but poor souls are banished from the north east. There's a few thin strips across the rest of the northern latitudes for asian, hispanic and black populations but seriously, I was under the impression that segregation ended decades ago. There's a small promontory for 'other' (whoever they are)? and it looks like Alaska and the Hawaiian islands have undergone some sort of ethnic cleansing. Hilariously, if Alaska and Hawaii had been positioned elsewhere they may have had a completely different ethnic composition. Overlay this detailed map with a weather map and we could probably infer that 90% of the white population will experience a sunny day and the rest won't (thanks to Craig Williams for that observation). But not in Colorado... the 100% white population will likely find it colder on the front range in 2010. 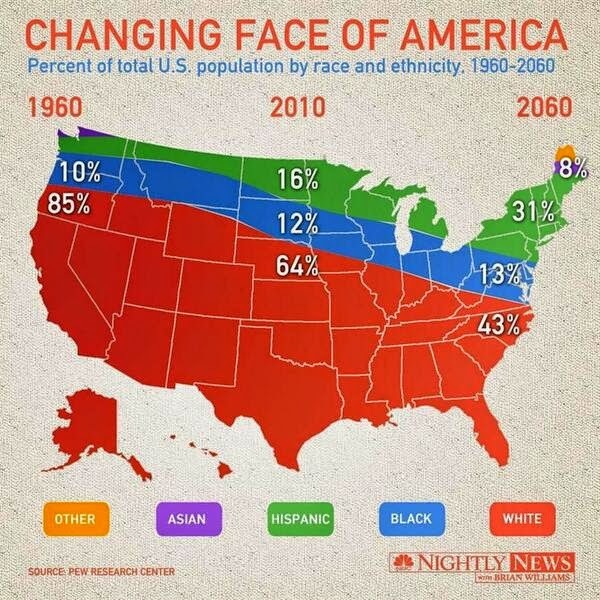 Another way to look at this map is that California, Oregon and Washington only existed in the 1960s and have been progressively been replaced over time with the eastern states. I guess for some that might be closer to reality than the map intended to suggest. Really, it's almost impossible to stop finding fault - it's a piece of cartojunk of the very, very highest order and will be used for years to come as one of the most purile, ill-conceived pieces of cartographic arse-gravy that anyone ever invented. Bravo!